The aged Staffordshire bull terrier was found to be “extremely thin and malnourished” and was put down. A TIPPERARY MAN has admitted to the neglect of an aged dog that has since been put down, the ISPCA has said. Yesterday, a 32-year-old man admitted two offences under sections 11 and 13 of the Animal Health and Welfare Act at Clonmel District Court. The case related to an old female black and white Staffordshire bull terrier that was reported to be abandoned at a property in March 2016. The dog was initially removed to PAWS Animal Rescue before being taken into the care of the ISPCA. Veterinary examinations found the dog to be “extremely thin and undernourished” weighing only 14.6 kgs. Growths on the dog’s abdomen and leg were also noted. Investigations by ISPCA Inspector Alice Lacey identified the owner of the dog, who claimed that although he was no longer living at the property where the dog was kept full-time, he had been visiting and feeding the dog daily. He admitted that he had noticed the dog was losing weight in recent months but had failed to seek veterinary treatment. Judge Lucey commented in court that “animals are at the mercy of their owners anh that the man had found himself in a very serious position being here today”. Convicting the man of failing to safeguard the health and welfare of the dog and taking into consideration his guilty plea, the fact that he was on social welfare, and his lack of previous convictions, Judge Lucey imposed a fine of €250 and ordered that the man pay €600 in ISPCA costs and contribute €250 towards legal costs. ISPCA Inspector Alice Lacey said: “Animal ownership is a responsibility and people have a legal duty to care for their animals whatever circumstances might arise. The ISPCA does not tolerate any form of cruelty, neglect or ill-treatment of any animals”. The dog was surrendered to the ISPCA but further veterinary assessment determined that treatment of the “several significant masses” under her abdomen and on her hind legs was not in the best interests of the welfare of the animal. The dog was euthanized on humane grounds. Members of the public can report animal welfare concerns to the ISPCA by contacting the National Animal Cruelty Helpline on 1890 515 515 or report cruelty online in confidence on www.ispca.ie. 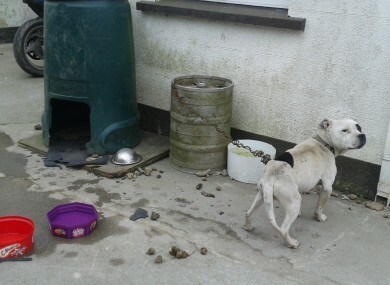 Email “Tipperary man admits to neglecting old bull terrier who had to be put down”. Feedback on “Tipperary man admits to neglecting old bull terrier who had to be put down”.